Welcome. This blog offers reflections on the gifts that grace our lives, even in the midst of stage IV cancer diagnoses or other lousy circumstances that come our way. Thank you for visiting. At their best, religions comfort and support people in the face of suffering. But sometimes the reasons religions offer for suffering can make things worse. If religious communities are to be places where those who suffer are able to communicate the truth of their reality and receive the support they need, the religious stories we tell need to be spacious enough to hold the grief, loss, and despair that accompany traumatic experiences like living with life-threatening illness. And for Christians, one way to do this is to take on the typical storyline and let it breathe. Most renditions of the Christian story begin with creation and the fall, then quickly move on to incarnation and redemption. But spending time in the psalms can help us see that the biblical story is less plot-driven and more complex than a tidy, linear, sin-redemption storyline often makes room for. Because Old Testament writings are Christian Scripture too (four-fifths of Christian Scripture, in fact, a reality often overlooked by Christians), prayer practices of the Psalms belong in any version of the Christian Story being told to those who are undone. In Psalm 77, the psalmist cries out, “I am so troubled that I cannot speak.” Placing experiences of living with serious illness within lament psalms and other irresolute spaces within the biblical story allows us to explore what it means to be undone by illness before God. The central character in these biblical stories is God, the One who creates and calls human beings into relationship with the divine and with one another. It’s important to note, as preacher Thomas Long does, that questions of God’s existence are not really on the table within the biblical text. The characters in the Bible do not ask, “I am undone by illness, I wonder if there’s a God?” Instead they cry out, “O God, why illness?” These moments are important not just because they open up space for those undone by serious illness to express their grief and anger. They’re also important because they speak to God’s relationship with and response to the people enduring illness and the trauma related to it. The psalms help us see that there is space to protest toward God, to be angry at God, to complain to God over suffering that simply is but that we desperately wish would not be. While some people who express such emotions do so because of a loss of or rejection of faith, the psalms help us see that such emotions are also belong inside the experience of faith. “I cry out and you do not answer me,” complains the psalmist in Psalm 22.21. Making more visible the spaces within religion for interrogation of God can be crucial for those who tend to view challenges to God as unfaithful. If people who are angry at God are given more opportunities to consider that their protest and anger can actually be part of a close, resilient relationship with God, they might be able to come to terms with protest as an aspect of a faithful relationship with God rather evidence of a lack of faith. One psalm that deserves more attention by those undone by trauma is Psalm 88, the most irresolute of all psalms. The psalmist’s soul is full of troubles (v. 3), buried under the weight of isolation brought on by psychic, spiritual, and emotional distress. There are repeated petitions to God, pleading for some sign of divine responsiveness: But I, O Lord, cry out to you; in the morning my prayer comes before you. O Lord, why do you cast me off? Why do you hide your face from me? This calling God to account emerges in response to testimony throughout the biblical narrative that the character of God is One who will always present, without fail. But the insistent questioning of God throughout the psalm indicts any attempt to cram suffering in a tidy framework. Why such suffering? Why doesn’t God respond? The questions hang suspended, unanswered. Even though experiences of the absence of God fill the prayers of the psalms and are so ubiquitous that even Jesus himself cannot avoid them, this particular kind of affliction often fails to get the attention it deserves. Biblical testimony of human beings’ relationship to God illustrates that the experience of God’s absence is much more than a momentary phenomenon for those who are struggling. From Solomon’s testimony in I Kings that God dwells “in thick darkness” to the lament in Psalm 88 over the hiddenness of God’s face, the people of God give voice to that anguished experiences of God’s apparent silence over suffering we so wish were not a part of our lives. Praying the psalms opens up pathways for those living with serious illness to see themselves as more than simply victims of the disease. Praying the psalms gives voice to the intense connection between the disease in our bodies and the inner turmoil of the heart. Praying the psalms gives voice to protest and anger and grief that accompanies life with serious illness, but it does so within the larger context of a relationship to the God who hears and responds to such anguished prayers. Lamenting together, to God, can open a way for the unendurable to be endured. Each of our lives bear the marks of suffering. And when we face intense experiences of suffering, we crave explanations for the “Why?”—answers for why things happen the way they do. Knowing why reassures us that we live in an orderly world that operates according to understandable laws. We want life to make sense. We want things to happen for a reason. It is not surprising, then, that dominant versions of the cancer story strive for meaning by placing life with serious illness in a moral framework. Those of us who live with cancer are cast in the role of warriors called on to battle our cancer with all we’ve got. Telling cancer stories through the use of military images provides a certain logic to illnesses like cancer: cancer is cast as an evil invader, and we are called to take the moral high ground by fighting and ultimately defeating it. A moral framework often remains in place when the cancer story meets up with the Christian story. The question of Why? becomes an insistent one. Why would a good God who overcomes moral evil allow illnesses like cancer to exist? Where’s the justice in such a diagnosis? We crave answers from a religion built around just conceptions of God. But when we pay attention to the lives of those with life-threatening illness—whether they are religious or not—the most insistent question tends less to be “Why?”—for so many of us, there’s simply no logical explanation as to why we were stricken with serious illness—than “How?”—as in how do I live into this reality that is now my life? And for those of us who claim the Christian Story as our story, the question becomes: how does the Christian story offer a framework of meaning to this cancer-filled life where meaning is constantly under threat? When events like a cancer diagnosis occur in the absence of any clear explanations as to the why, we are confronted with an unordered, unstructured, even lawless sense of the world. Unexplainable evil, or that which seems to be unexplainable, threatens the sense we try and make of our lives. What’s needed is more space in the tellings of the Christian Story—as well as in communal enactments of that Story and the living out of the Story’s call to care for those who suffer—for the unexplainable that comes from living with serious illness. In the 1990s, life-threatening illness was added to the list of events and conditions that can cause post-traumatic stress disorder (PTSD). In so doing, psychiatrists were acknowledging that the threat to life and bodily integrity due to cancer or other serious illnesses can precipitate deep senses of fear, devastation, a lack of control—all symptoms of PTSD. 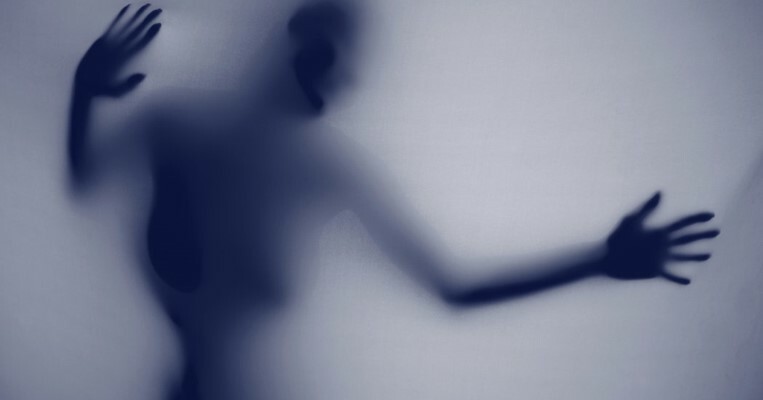 Even as important similarities exist between the ways trauma works in the lives of those who’ve endured traumatic acts of violence and the lives of those who live with life-threatening illness, a key difference is this: rather than an enemy invasion or threat from the outside, illnesses like cancer are primarily internal threats. As Augustus Waters, the teen-aged character dying of cancer in John Green’s The Fault in Our Stars, wonders out loud, “What am I at war with? My cancer. And what is my cancer? My cancer is me. The tumors are made of me. They’re made of me as surely as my brain and my heart are made of me. . . .” That our cancer is “us” creates a distinctive way of experiencing trauma related to living with an internal reality that threatens to destroy us from the inside out. Applying the lens of trauma to those living with life-threatening illness deepens our understanding of the range of emotional responses that occur when living with cancer; talk of trauma opens up more breathing room for those who live with cancer, and it offers those who care for people who are really sick a broader framework in which to offer that care. Sociologist of illness, Arthur Frank, argues that when those of us who are ill get to tell our stories and have them really listened to, the potential for healing increases. The language of trauma helps us resist versions of the cancer story and the Christian story that are too tidy, too resolute. Instead, making space for trauma allows us to acknowledge our not-yet-resurrection reality. And acknowledging where we really live can empower us to tell our messy, irresolute stories, and move into a space where healing becomes possible. By the time I was diagnosed with metastatic cancer in December 2008, the cancer had spread from breast to bones, fracturing two vertebrae and camping out in my pelvis and hips. Intense treatment regimen made me even sicker, forcing a trip to the ER and a New Year’s Eve in the hospital talking with my husband about where I would be buried. While family and friends immediately located statistics on my prognosis, it took being weaned off oxycodone before it occurred to me to find what others had found: the pronouncement that five years out, eight percent of people who have the cancer I have are dead. 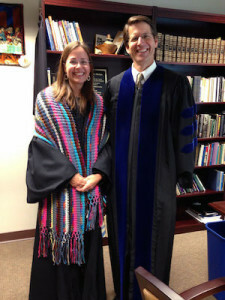 As a religion professor, I get paid to talk about God. But being diagnosed with stage IV cancer left me without words for (or directed toward) God, without words for what it might mean to live with or in spite of incurable cancer. Effects of treatment and back surgery made death’s nearness seem even nearer. I struggled to get out of bed and dress myself; I couldn’t drive to and from the mountains of appointments. I resigned from virtually every part of my full and wonderful life. When I cried my way through an entire appointment, the oncologist referred me to a cancer counselor. The counselor encouraged me to write letters to my daughters for them to open on their graduations, wedding days, expressing how much I wish I could be there to celebrate their special day. But as winter turned to spring, the pain from back surgery receded enough for me to take off the Fentanyl patch and start physical therapy. I started driving again and even made a couple meals each week. After months of being overwhelmed by the incurable status of my cancerous life and fearing the end was near, I went into remission, a lovely, disorienting, state of being. And in this feasting amid the crying and the grieving, my life mapped the movement of the Christian gospel story in a way I never imagined it could: I have experienced firsthand a death and a resurrection. I have witnessed new life growing out of the ashes of death and destruction. It doesn’t get more Christian than that. For months following my diagnosis it looked likely that this cancer story would swallow me whole. When it didn’t, it was the Christian story that helped make sense of what had happened. Dawn had come. I had been given new life. In the past nine years I have lost and found remission not once, but three times. And while any day with remission is better than any day without it, there are lots of days when the death-to-new-life storyline seems too constrained to hold the frayed edges of life with cancer. From the earliest days of my cancer story, the diagnosis-treatment-survivorship plotline has seemed too streamlined, too linear, to allow enough space for the incurable version I’m living. The fickle status of remission, ongoing oncology visits and chemo treatments leaves me searching for bigger versions of the stories that interpret my life. While our tellings of the Christian story bend toward resolution, the plots of our own lives tend to stubbornly resist it. One insight from the field of trauma studies is that living in the aftermath of traumatic events requires attending to ways traumatic after effects interrupt life in the present. Emerging research on illness-related trauma can contribute to a more complicated telling of the Christian story that makes more space for those traumatized by serious illness. 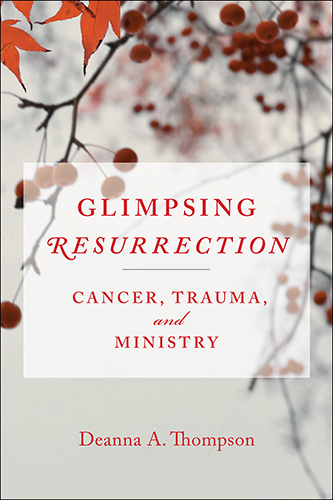 My new book, Glimpsing Resurrection, explores what it’s like to become undone by cancer and how the lens of trauma enables us to better understand the long-lasting emotional, psychological, and spiritual effects of illness. Paying closer attention to places of lament and irresolution in the biblical narrative helps create a spaciousness that can hold our undoneness. The language of trauma and the practice of lament equip us to better minister to those who live with serious illness, and when the trauma of illness is acknowledged and addressed, it becomes possible, even when illness remains, to glimpse resurrection, both here and now and in the life to come. We stand today on the cusp of the holiday season, a time (we hear from the endless advertising) to laugh, to sing, to entertain, to dance, to revel in the wonderfulness of it all. It’s the hap-happiest time of the year. It’s a season that’s supposed to overflow with one side of the Ecclesiastes equation—to be a time when all the good things are rolled into one. I have to admit that before 2008 I wasn’t nearly as aware of or interested in the practice of lament. By lament I mean the expression of sadness, grief, mourning that comes from experiencing the shadow sides of life. But right in the middle of the most wonderful time of year, right when silver bells were ringing, I was diagnosed with incurable stage IV cancer days after my 42nd birthday. Rather than decorating a tree at home I was living at Abbott Northwestern Hospital, spending my days being wheeled through the halls from one scan to another, one radiation treatment to another. I’m a professor, which means I’m a professional talker of sorts, and it was jarring for me to go from living in an abundance of words to a space where words were hard to come by. In those early December days of the diagnosis, those who loved me understood the severity of my condition better than I did. They wept, and I remained word-less, unsure about how breast cancer could break two of my vertebrae, about why and how breast cancer had spread to a dozen places in my bones. In a season that’s dedicated to celebrating, we found ourselves in a season of sorrow, of mourning–of lament. We often think of words of the psalms as focused on praise and thanksgiving, words that offer comfort to those who sorrow–and all of those things are true. But it is also true that forty percent of the 150 psalms in the Bible—that’s sixty psalms—are dedicated to lament. They are full of cries of anguish, of brokenness, of the absence of God. We don’t talk about this enough—that cries of lament are cries from within the experience of faith—it’s true that expressions of lament are present throughout the Bible, but especially in the psalms. The psalms are prayers and hymns that are meant to be used by those who are enduring a season of sorrow. As is the case for anyone who endures a traumatic event—the world looked different to me after my cancer diagnosis. My very first public outing after being released from the hospital was to attend a Santa Lucia choir performance sponsored by the American Swedish Institute. Both my daughters—ages 12 and 9 at the time—were in the choir. This centuries-old practice of singing into the darkness suddenly looked different to me, too: the story of Santa Lucia’s suffering and martyrdom made itself felt as we gathered in that downtown cathedral. At the darkest time of the year, we remember the life of a saint whose life was marked by hardship; we gather into a space alight with candles and singing, a ritual that holds the season of sorrow together with the season of hope. On that dark December 13th in 2008, I wondered if it was the last time I would see my girls sing in a Lucia performance. I felt with aching clarity the power of the young voices singing the dark away, even as the darkness seemed to be at its most powerful. But as I continue to be granted more time to figure out how to live with advanced-stage cancer, I have grown more aware of how this season of joy is very often, also, a season of sorrow for so so many. It’s a time to mourn lost health, or a time to grieve that one who is beloved to us will be absent at this year’s holiday gatherings. Framed in a religious context, this season leading up to Christmas is called Advent, which is a time of watching, of waiting, a time spent in darkness hoping for light. And while Christmas is commonly understood as a time to celebrate, a number of hymns of the season don’t want us to forget that this day when Christians celebrate God becoming flesh cannot be separated from the later part of the story—the parts where God made flesh undergoes suffering and death. All this may sound like I’m counseling against laughing and dancing and singing and celebrating during the season of glistening snow and holiday cheer. But that’s actually not my point at all. I must confess that this is actually my favorite time of year, a time where I’d love to be dancing and laughing, and embracing all that is good. It’s just that moving into the land of the unwell has made it much more difficult for me to ignore the amount of sadness that also often accompanies this time of year. And just as the wise author of Ecclesiastes attests, it’s rarely a time just for mourning or just for celebrating. Most often, it’s a time for both. And having now had almost nine years to mark the date of my life changing by virtue of a cancer diagnosis, I have realized that acknowledging and making space for the times to mourn actually makes more space for the times to laugh and the times to hope. As is the case for virtually all the lament psalms as well, the time for lament helps propel us toward a time to hope. Psalm 22, that psalm that begins with such intense sorrow and anguish, ends with words of hope. The psalmist declares that one day, the poor will eat and be satisfied, that the Lord will listen to our cries for help. One of the gifts we can give each other at this season of light illuminating darkness is to acknowledge and make space for the occasions for lament not only in our own lives but in the lives of others. I worry that many of us feel pressure to only talk about or make room for the happy aspects of the season. But when we acknowledge it’s also a season of lament, I have found, that we can more fully enter into the joyous occasions, because there’s room enough in the season for both. One of the last times I visited my Grandmother at the Care Center where she lived, staff members wheeled her hall-mate out on a gurney. “We all come here to die,” my Grandmother said matter-of-factly after her sheet-covered neighbor passed from view. She was right: residents in her wing of the Care Center weren’t waiting to get better or younger or to move somewhere else. This building was their last stop in this life. She and her neighbors had come there to die. Words failed me at that moment, as they often do when we come face-to-face with the limits of our existence. I held her hand as her words about death lingered in the space between us. The conversation gradually picked up again and we talked about goings on of various members of our extended family. Invariably Grandma’s information was more up-to-date than mine on cousins and great aunts and family friends. Even as the world she inhabited narrowed, her sharp mind and wit enabled strong connections to a much wider world beyond her tiny room. It was true that she longed for death. But even as the end drew very near, Grandma died like she was living. I have stage IV breast cancer and I blog about it. But I’m not the only one—with the disease or with a blog. 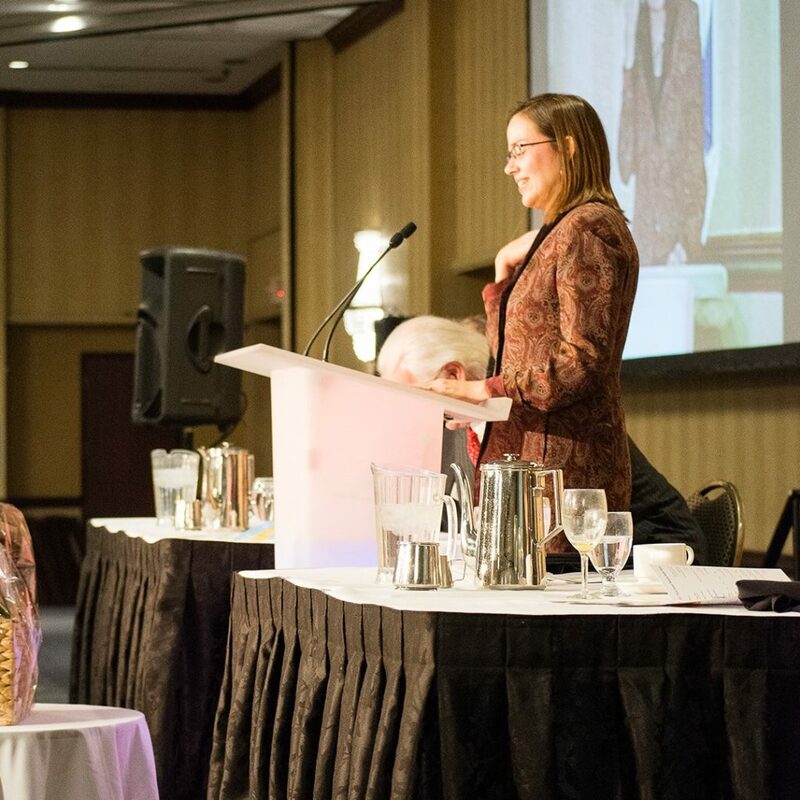 Lisa Adams, metastatic breast cancer patient and blogger with a national profile, recently became a touchstone for national debate about the use of social media in publicly chronicling a serious illness. In early January, two journalists, one at the New York Times and one at the Guardian, wrote pieces critical of some of Adams’ treatment choices as well as the way she lets readers into her life with cancer via blogs and tweets. Outrage over Bill and Emma Kellers’ pieces (who happen to be married) was swift and fierce, not just for the critical questions they raise about Adams’ choices but for inaccuracies in important details (like getting the number of Adams’ children wrong, or how long she’d been living with metastatic breast cancer) and in including quotes from private correspondence with Adams without permission, prompting the newspapers’ opinion editors to publish pieces alternately apologizing for and defending the journalists (if you want to read more, here’s one place to start: The Guardian website). Perhaps the most controversial aspect of Bill Keller’s “Heroic Measures” column is his not-so-subtle suggestion that Adams should consider going more quietly into that dark night rather than aggressively treating the metastasizing cancer. In weighing the alternatives, he contrasts the treatment regiment of Adams to his own father-in-law’s “unplugged” death from cancer in Britain last year. Here Keller is wading into much-larger debates about not just how the U.S. apportions its medical dollars but how and when those of us with advanced-stage cancer (and other really bad conditions) should embrace the inevitability of death. I’m keenly aware of these debates, as they often play out in my own head. When I learn “my” cancer has metastasized from the bones to the liver or the lungs, how much aggressive treatment will I opt for? How are we supposed to decide when enough’s enough? When I was diagnosed with stage IV cancer, I started preparing to die. Granted, we should all “live like we’re dying” as singer Kris Allen reminds us, but an aggressive diagnosis ups the urgency on doing just that. I went back to teaching even though I could barely stand up because I wanted to be in the classroom one last time. I stopped buying new clothes because I didn’t think I’d have much time to wear them. I insisted on a summer vacation even though my stamina was shaky because I thought that would be the last one I’d take with the family. My husband and I secured burial plots. There didn’t seem to be much time, and I was intentional in my preparations for the end. Then I went into remission. Having already resigned from my life, I gradually let myself believe that there could be another semester in the classroom, that if I bought new clothes I’d have some time to wear them, that I might get to experience another family vacation. What an amazing turn of events. Thank God, thank the doctors, thank the world for allowing me more time. First there were butterfly crackers and squares of cheese at the kitchen table. Amma spoke Tamil and I didn’t understand, but I knew she got out the crackers and that she cut the squares of cheddar for me. I liked adults who did this. I was four, and I liked Amma. Next there were nightgowns at Christmas – beautiful and lacy – fresh off Amma’s sewing machine. “Thank you,” I said when my parents nudged me, and I hugged her, feeling her stiff, silky sari under my little hands. 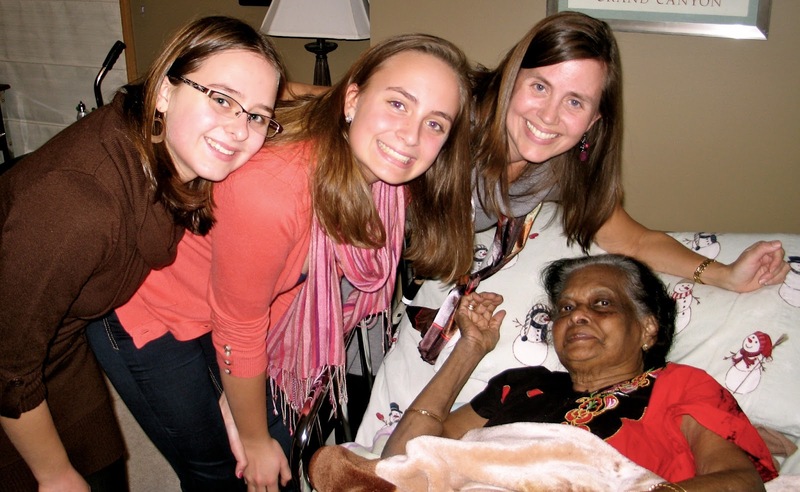 It was so unlike what my mother and aunts wore, but it felt right on her, because she was Amma. Later, there were dresses and stockings, sewn and knitted, even as I started to notice Amma’s bony brown hands and wondered, Should they still be sewing?